More links for "Racing Series S-Line SL4000 Rev. 2 Gaming Chair Black/White Edition"
I bought this chair to replace another which has a broken gas adjuster so its like sitting on the floor. Having put this one together very quickly and easily the first thing i noticed is its SO low. on its highest setting its the same height as my old one with the broken adjuster. Its small and more suited for children or the smaller adult but if you are over 6ft forget it (im 6ft 3). the arms are a very naff plastic not even padded. i feel like im in primary school sitting on this thing,it`s not what i would expect for £260. i bought it after reading the good reviews here but they must be short is all i can say. i dont even fully fit width wise on the seat and im not particularly wide. it`s going back and ill look for a grown ups chair. 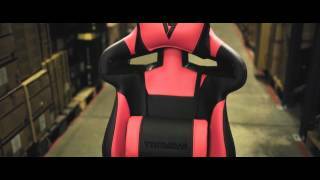 Fantastic chair that you will not regret buying! Great chair, its comfortable, has lots of adjustment and is easy to put together by 1 person. Only negative things are the lumbar cushion is quite stiff for me and i find it unusable.This leads into my second problem the backrest has very little padding. It's still comfortable but if the backrest had more padding it would be perfect. this is without doubt the most comfortable chair I have ever sat in. Ever. 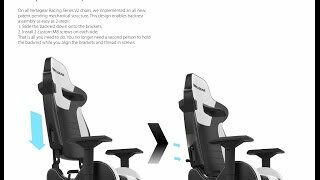 The build quality is very high, looks even more expensive than it is and is highly adjustable to make the perfect seating experience.